Published by Acumen Publishing, the publication arm of CAL, the three books feature reflections by 40 authors from 15 countries including Australia, Bangladesh, Cambodia, Germany, Iran, Japan, Korea, Kosovo, Kyrgyzstan, Malaysia, Pakistan, Singapore, Slovakia, the United States and Uzbekistan. These authors participated in various CAL’s programs that were held across the globe in 2016, targeting youth, scholars and working professionals worldwide. Dr. Elizabeth Lee, Senior Executive Director of Sunway Education Group and Sunway University (far left), Tan Sri Dr. Jeffrey Cheah, Founding Trustee of the Jeffrey Cheah Foundation (fifth from left) and Samuel Kim, President and Co-founder of the Center for Asia Leadership (far right) in a group photo with authors of Next Generation Leadership. 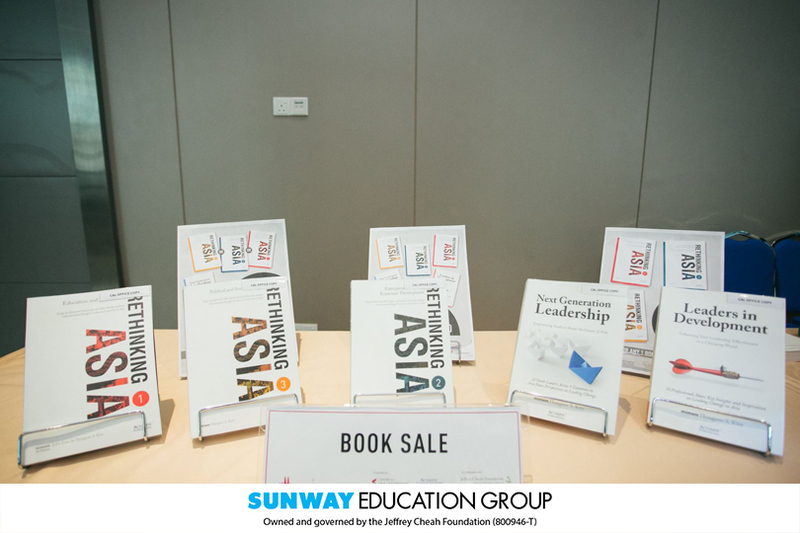 The books are recommended for inquisitive readers who wish to tap into their leadership potential as the publications document the authors’ experiences on discovering the leader within and seeing the world, especially Asia from a fresh perspective. 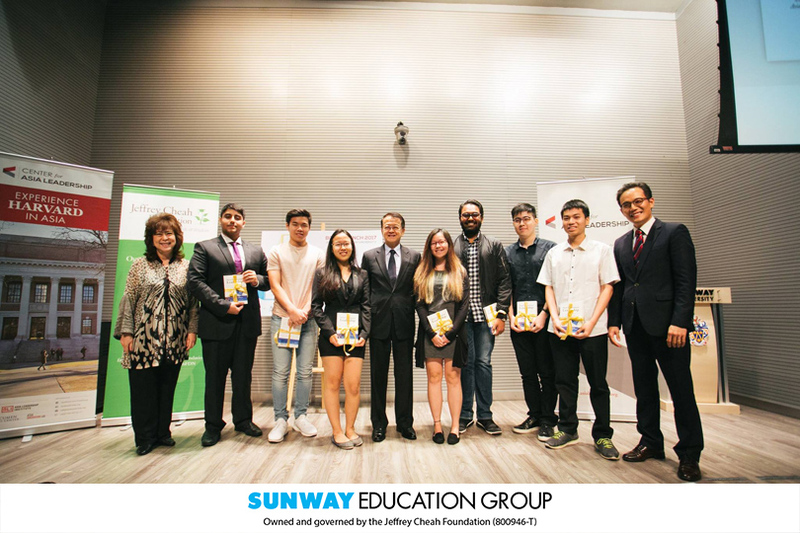 Tan Sri Dr. Jeffrey Cheah, AO, Founding Trustee of the Jeffrey Cheah Foundation, and Chairman and Founder of Sunway Group commended CAL for its efforts and commitment in nurturing future leaders to make a difference in an increasingly globalised world. 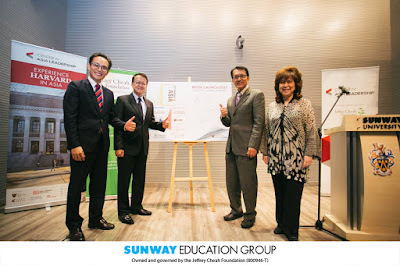 Dr. Elizabeth Lee, Senior Executive Director of Sunway Education Group and Sunway University (far left), Tan Sri Dr. Jeffrey Cheah, Founding Trustee of the Jeffrey Cheah Foundation (sixth from left) and Samuel Kim, President and Co-founder of the Center for Asia Leadership (far right) in a group photo with authors of Leaders in Development. “The goals of the Center for Asia Leadership are closely aligned with those of the Jeffrey Cheah Foundation. The collaboration between the two provides more talented Malaysians with unprecedented access to learn leadership skills from Harvard, Stanford and other world-renowned universities,” said Tan Sri Dr. Jeffrey. “Adding three new titles in little more than a year is no easy feat. I would like to congratulate the CAL team and all the authors on this significant milestone. 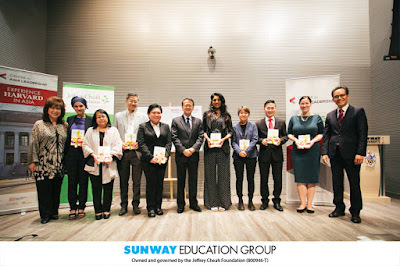 I am confident that the newly published books will contribute to the growth of skills needed to overcome the challenges and seize the opportunities in Asia as well as advancing sustainable development in the region, an agenda that the Jeffrey Cheah Foundation holds dear,” he added. The five books on sale during the launch. Samuel Kim, President and Co-founder of CAL said that reflection is a crucial part of the leadership journey as it enables us to realise our strengths and weaknesses, and understand how our experiences shape the way we see ourselves and our surroundings. “These new books encompass views and compelling stories drawn from the authors’ leadership experiences in their professional and personal lives after participating in CAL’s training programs. The books aim to provide both past and future talents with valuable observations for continuous growth and development to achieve their goals,” said Kim. “It is often said that the 21st century is the Age of Asia. We are on this shared journey of defining a future that is purposeful for the region. Under Acumen Publishing, CAL will continue to offer groundbreaking ideas and disseminate insightful analyses through future initiatives and publications to help leaders link their capabilities to positive results,” he added. The launch included a reading session by Bryan Chay, Alice Smith School, one of the 22 authors for Next Generation Leadership: Empowering Youth to Shape the Future of Asia; Dr. Cordelia Mason, Asian Institute of Finance, one of the 10 authors for Leaders in Development: Enhancing Your Leadership Effectiveness in a Changing World; and Umar Shavurov from Kyrgyzstan, one of the eight authors for Rethinking Asia 3: Political and Social Change. The authors read excerpts from their chapters, recounting their personal experiences and expressing their views on how their participation in the CAL programs have impacted their leadership odyssey. The event also revealed the second edition of Rethinking Asia 1: Education and Innovation and Rethinking Asia 2: Entrepreneurship and Economic Development. Rethinking Asia 1: Education and Innovation consists of personal essays from graduate students and Fellows from Harvard, MIT and Tufts University who participated in the Asia Leadership Treks and Asia Leadership Fellowship Tours in 2014. Rethinking Asia 2: Entrepreneurship and Economic Development comprises seven reflections from graduate students and Fellows from Harvard, MIT and Stanford University who participated in the Asia Leadership Treks and Asia Leadership Fellowship Tours in 2015. Distributed in Malaysia by MPH Distributors, all five books are available at major bookstores nationwide. Customers can also purchase the e-copies from Amazon Kindle (https://www.amazon.com/Kindle-eBooks). 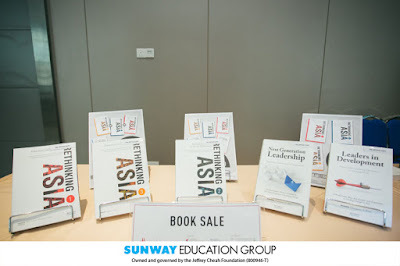 The retail price for Next Generation Leadership: Empowering Youth to Shape the Future of Asia and Leaders in Development: Enhancing Your Leadership Effectiveness in a Changing World is RM48 each. Meanwhile, Rethinking Asia 1: Education and Innovation, Rethinking Asia 2: Entrepreneurship and Economic Development and Rethinking Asia 3: Political and Social Change are sold at RM59.90 each.